This paper proposes that right dislocation of an argument to the post-verbal position in Korean involves two different structures, rightward movement and bi-clausal adjunction following ellipsis, based on prosodic and syntactic evidence. Focusing on Seoul Korean, I also argue that rightward movement is triggered by a focus effect, achieved by the movement of non-focused element bearing old information, and bi-clause adjunction expresses afterthoughts through repetition of a clause. Rhythm is widely acknowledged to be an important aspect of speech and music, and theoretical work on rhythm within each domain has long expressed interest in possible connections with the other domain. Yet empirical studies comparing rhythm in speech and music are rare. In this talk I will argue that the paucity of research reflects a fixation on periodic rhythms in human auditory cognition, and that meaningful connections between linguistic and musical rhythm are more likely to be found in the domain of nonperiodic rhythms, i.e., in systematic patterns of timing, accent, and grouping which have nothing to do with periodicity. Two lines of cross-cultural empirical research will be used to support this argument, one concerning differences in how Americans vs. Japanese listeners hear simple nonlinguistic rhythms, and one concerning reflections of speech rhythm in instrumental classical music. The final lab meeting of the year will be dedicated to results of projects created by Turkshop participants. We will hear from Benjamin Storme about his project on wh long extraction in French. Yasu will be moving to London from Paris, where he has spent the past year as a post-doctoral fellow at the Institut Jean Nicod. Congratulations, Yasu!! An article by Martin Hackl on the Syntax-Semantics Interface has appeared in a special June issue of the journal Lingua. The purpose of the special issue, as summarized by its editor, Luigi Rizzi, is “to present some fundamental ideas and empirical results of modern syntactic research, and make them available to the scientific communities interested in the study of language as a cognitive capacity” - an especially important task at a time when interest in linguistic questions is increasing within cognitive science. 2013 Levitan Award for Excellence in Teaching for Isaac Gould!! Isaac has been a teaching assistant for two classes, our undergraduate introductory class 24.900 Introduction to Linguistics in Fall 2011 and the first-year graduate class 24.951 Introduction to Syntax in Fall 2012, and was an outstanding teacher in both classes. This is a great honor for Isaac. We are very proud of him! P.S. Isaac is in fact the second linguistics graduate student to win this award in the last four years. Click here to learn who our 2010 winner was. Next weekend, three talks from MIT will be presented at the 20th meeting of the Austronesian Formal Linguistics Association at the Arlington campus of the University of Texas. At this year’s AFLA, Norvin Richards, one of three invited speakers at the conference, will be asking and answering the question “Why are so many Austronesian languages verb-initial”. Fourth-year student Michael Yoshitaka Erlewine will be speaking on ”Topic, Specificity, and Subjecthood in Squiliq Atayal” (research arising from his fieldwork in last summer as a member of the NSF-hosted East Asia and Pacific Summer Institute in Taiwan). Third-year student Ted Levin will be speaking on the topic of ”Dissolving the Balinese Bind: Balinese Binding and The A/A-Bar status of Spec TP”. But that’s not all! Joey Sabbagh (PhD 2005) is one of the conference organizers, so we know it will be a great meeting. The final linguistics colloquium of the semester takes place this Friday. This talk is part of a reflection about the status of linguistic generalizations of the form: “Sentence S is acceptable to the extent that it satisfies property P”, where a linguistic intuition is related with an abstract, objective, mathematical property P. As a case study, we will defend the following version of the good-old generalization about the distribution of NPIs: “NPIs are acceptable *to the extent that* they are in an environment that is recognized as downward entailing”. We will present two sets of results in favor of this subjective version of the generalization. First, we will show that the acceptability of an NPI for a given speaker best correlates with the ability of this particular speaker to recognize that the environment is downward-entailing (Chemla, Homer, Rothschild, 2011). Second, we will show that the presence of a polarity item influences inferences comprehenders are willing to draw. Roughly, they create illusions of monotonicity (contra Szabolcsi, Bott, McElree, 2008). We will show that the shape of these illusions provides further direct evidence in favor of the generalization we defend and against previous approaches (in particular, they go against the idea of local licensing of NPIs under double negations, see Chemla, Homer, Rothschild, in preparation). We will conclude with a discussion about: (a) the position of our generalization with respect to critical configurations discussed in the literature about polarity items (Schwarz/Heim puzzle, non-assertive environments such as questions, etc. ), (b) what such results teach us about the linguistic ability and its interface with other abilities. The weekend before last, David Pesetsky journeyed to McMaster University in Hamilton, Ontario, where he was a keynote speaker at the 22nd annual conference on Formal Approaches to Slavic Linguistics (FASL 22). In his talk, entitled “Dvuxètapny case assignment and Richards’ conjecture: the Tangkic language Russian, and the Slavic language Lardil”, he argued that the proposal of a deep kinship between Russian and Lardil case marking proposed by Norvin Richards in the article blurbed here runs even deeper. FASL 22 was brilliantly organized by our own Ivona Kučerová (PhD 2007), with a great team of McMaster students. Guillaume Thomas (PhD 2012), Is the present tense vacuous? 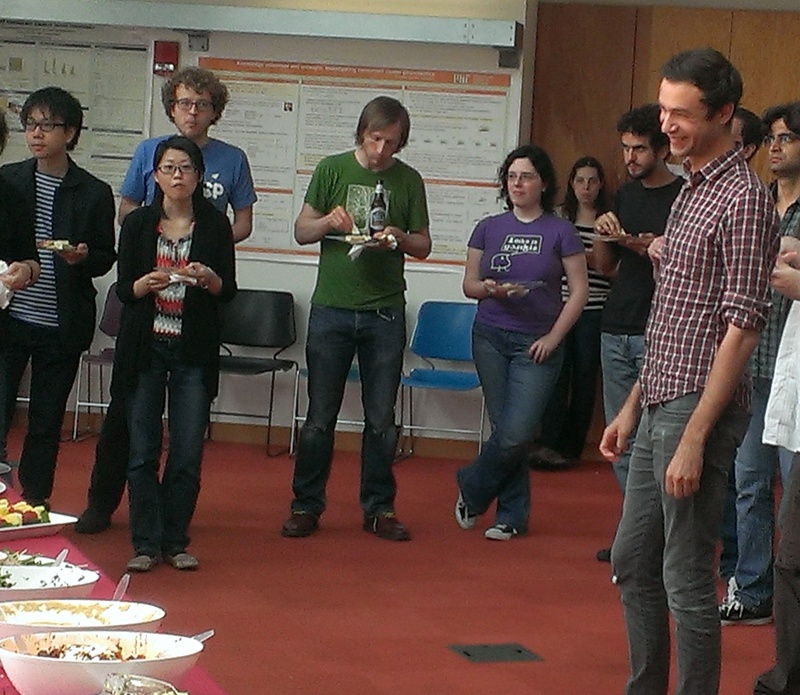 Last Wednesday, the department said our enthusiastic but tearful good-bye to Maziar Toosarvandani, who has been an active, much appreciated member of the department for the past two years as an American Council of Learned Societies New Faculty Fellow — and is now taking up an Assistant Professor position at UC Santa Cruz (as reported here). The grad students presented Maziar with two books about MIT and the Stata Center to remember us by, sentimental speeches were made, N. Paiute nominals and the Persian ezafe construction were discussed, and lots of great food was consumed!